2 sheets Phyllo Dough 18" x 14"
Cut asparagus spears into 4-in. lengths (discard stalks or save for another use). In a large saucepan, bring 1/2 in. of water to a boil. Add asparagus; cover and boil for 2 minutes. Drain and immediately place asparagus in ice water. Drain and pat dry. Stack both sheets of phyllo dough on a work surface. Cut the stack in half lengthwise, then widthwise into thirds. Separate pieces and brush with some of the oil. Sprinkle each with 1 teaspoon cheese. 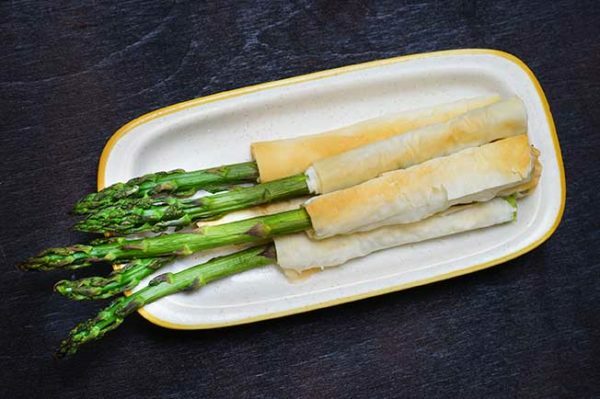 Place one asparagus spear along one side of each piece of phyllo dough. Sprinkle lightly with pepper; roll up tightly. Place seam side down on an ungreased baking sheet. Brush tops with oil. Roast at 400° for 7-9 minutes or until golden brown.